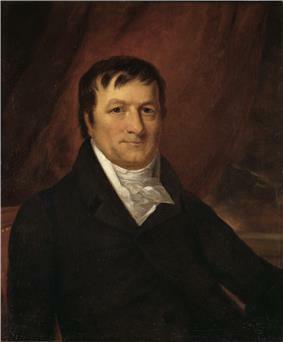 John Jacob Astor (July 17, 1763 – March 29, 1848), born Johann Jakob Astor, was a German-born American businessman, merchant, fur trader, and investor who was the first prominent member of the Astor family and the first multi-millionaire in the United States. He was the creator of the first trust in America. He emigrated to England as a teenager and worked as a musical instrument manufacturer. Astor moved to the United States after the American Revolutionary War, He entered the fur trade and built a monopoly, managing a business empire that extended to the Great Lakes region and Canada, and later expanded into the American West and Pacific coast. Seeing the decline of demand, he got out of the fur trade in 1830, diversifying by investing in New York City real estate and later becoming a famed patron of the arts. "Astor, John Jacob, an American merchant". "Astor, John Jacob, American merchant". "Astor, John Jacob". The New Student's Reference Work. 1914. "Astor, John Jacob. An American merchant". Ebeling, Herbert C. Johann Jakob Astor zum 150. Todestag. Walldorf: Astor-Stiftung, 1998. Ebeling, Herbert C. Johann Jakob Astor - Ein Lebensbild. Walldorf: Astor-Stiftung, 1998. Ebeling, Herbert C. W. O. Horn: Johann Jacob Astor - Ein Lebensbild aus dem Volke, für das Volk und seine Jugend. Walldorf: Astor-Stiftung, 2004. ^ a b "The All-Time Richest Americans". Forbes.com. September 14, 2007 . ^ Jacob was always written with a 'c' in the records of Walldorf's Reformed Church, but Walldorf's Rev. Georg Speyer spelled the name with a 'k' in his laudatio for Astor's 50th death-ceremony. From then on that spelling was used in Astor's hometown. (see Herbert C. Ebeling. Johann Jakob Astor zum 150. Todestag, 1998, p. 2). ^ "John Jacob Astor". Harper’s New Monthly Magazine (Harper's Magazine Co.) 30: 308–323. 1865. Retrieved 2009-06-07. ^ "Famous Masons". MWGLNY. January 2014. ^ "The Opium Kings: Opium Throughout History". ^ In 's richest AmericansFortune Magazine, with an estimated wealth at death of $20,000,000, Astor's Wealth/GDP ratio equalled 1/107. ^ "Warum heißen die so? Heute: FC Astoria Walldorf" (German). Fussball.de. December 8, 2011. Retrieved December 9, 2011. Astor left the bulk of his fortune to his second son William, because his eldest son, John Jr., was sickly and mentally unstable. Astor left enough money to care for John Jr. for the rest of his life. Astor is buried in Trinity Church Cemetery in Manhattan, New York. Many members of his family had joined its congregation but Astor remained a member of the local German Reformed congregation to his death. Herman Melville used Astor as a symbol of men who made the earliest fortunes in New York in his novella, Bartleby, the Scrivener. In his will, Astor bequeathed $400,000 to build the Astor Library for the New York public (later consolidated with other libraries to form New York Public Library), and $50,000 for a poorhouse and orphanage in his German hometown of Walldorf. The Astorhaus is now operated as a museum honoring Astor and serves as a renowned fest hall for marriages. Astor donated $25,000 to the German Society of the City of New York, whose chairman he was from 1837 until 1841. Also, he bequeathed $30,000 for a professor's chair in German literature at Columbia University, but due to differences he had with the deanship, he erased this donation from the testament. At the time of his death in 1848, Astor was the wealthiest person in the United States, leaving an estate estimated to be worth at least $20 million. His estimated net worth, if calculated as a fraction of the U.S. gross domestic product at the time, would have been equivalent to $110.1 billion in 2006 U.S. dollars, making him the fifth-richest person in American history. An estimate based on inflation from the legally-set American gold standard rate of $21 per ounce in the 1850s would result in a much more conservative net worth of $1.272 billion in 2011 dollars. In the 1830s, Astor foresaw that the next big boom would be the build-up of New York, which would soon emerge as one of the world's greatest cities. Astor withdrew from the American Fur Company, as well as all his other ventures, and used the money to buy and develop large tracts of Manhattan real estate. Astor correctly predicted New York's rapid growth northward on Manhattan Island, and he purchased more and more land beyond the then-existing city limits. Astor rarely built on his land, and leased it to others for rent and their use. After retiring from his business, Astor spent the rest of his life as a patron of culture. He supported the ornithologist John James Audubon in his studies, art work and travels, and the presidential campaign of Henry Clay. In 1804, Astor purchased from Vice President Aaron Burr, Jr. what remained of a 99-year lease on property in Manhattan. At the time, Burr was serving under President Thomas Jefferson and desperately needed the purchase price of $62,500. The lease was to run until 1866. Astor began subdividing the land into nearly 250 lots and subleased them. His conditions were that the tenant could do whatever they wish with the lots for twenty-one years, after which they must renew the lease or Astor would take back the lot. Astor's business rebounded in 1817 after the U.S. Congress passed a Washington Irving in his travelogue Astoria. Astor's commercial connections extended over the entire globe, and his ships were found in every sea. Astor's fur trading ventures were disrupted during the War of 1812, when the English captured his trading posts. In 1816, he joined the opium-smuggling trade. His American Fur Company purchased ten tons of Turkish opium, then shipped the contraband item to Canton on the packet ship Macedonian. Astor later left the China opium trade and sold solely to England. Astor took advantage of the Jay Treaty between England and the United States in 1794, which opened new markets in Canada and the Great Lakes region. In London, Astor at once made a contract with the North West Company, who from Montreal rivaled the trade interests of the Hudson's Bay Company, then based in London. Astor imported furs from Montreal to New York and shipped them to Europe. By 1800, he had amassed almost a quarter of a million dollars, and had become one of the leading figures in the fur trade. His agents worked throughout the western areas and were ruthless in competition. In 1800, following the example of the Empress of China, the first American trading vessel to China, Astor traded furs, teas, and sandalwood with Canton in China, and greatly benefited from it. On September 19, 1785, Astor married Sarah Cox Todd (1762–1834), the daughter of Scottish immigrants Adam Todd and Sarah Cox. Although she brought him a dowry of only $300, she possessed a frugal mind and a business judgment that he declared better than that of most merchants. She assisted him in the practical details of his business. Henry was also a horse racing enthusiast, and purchased a thoroughbred named Messenger (horse), who had been shipped from England to the United States in 1788. The horse became the founding sire of the Standardbred breed in the US; it became the primary breed used for trotters and pacers. Astor immigrated to New York City in the United States in March 1784, just after the end of the Revolutionary War. His second brother Henry had preceded him to New York, establishing a butcher shop with which Astor was initially involved. He began trading furs with Native Americans and in the late 1780s started a fur goods shop in New York City. He also became the New York agent of his brother's musical instrument business.